Imagine a world without antibiotics. A cut to your finger could leave you fighting for your life. Before antibiotics, medics used various measures to protect against disease-causing bacteria. 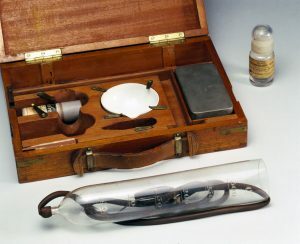 Strict hygiene was universally important and individual treatments were used for specific illnesses. For example, tuberculosis, a bacterial infection of the lungs, could only be treated with fresh air and rest. As bacteria gain the ability to resist the effects of our antibiotic drugs and no new drugs are developed, our past could become our future. Without antibiotics many medical procedures would not be possible, including clean surgery and organ transplantation, chemotherapy for cancer patients and care for premature babies. Penicillin was not the first antibiotic. Before the work of Howard Florey and his team, other drugs had already revolutionised the treatment of infections. Salvarsan was produced in Germany by the medical scientist Paul Ehrlich to treat syphilis. In 1909 Ehrlich used the phrase ‘magic bullet’ to describe this new wonder drug. It became one of the most prescribed drugs in the world, though the bacteria that caused syphilis quickly started to develop resistance to the treatment. During the 1930s, chemists in Germany, France, and Britain discovered a whole range of new and effective chemical antibiotics. These drugs were called sulphonamides; they revolutionised the treatment of previously deadly bacterial infections. The sulphonamide M&B 693 was developed in Britain and first prescribed in 1938 to treat pneumonia. The most famous patient saved by the drug was British Prime Minister Winston Churchill, who contracted pneumonia at the height of the Second World War. The drug most likely saved his life and the success of the treatment was widely reported in the press. 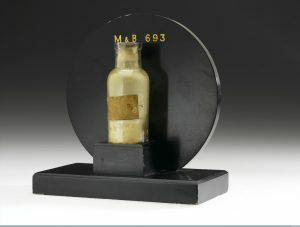 This original laboratory sample of M&B 693 was produced by May and Baker of Dagenham. The Salvarsan in this kit was made by a German manufacturer commonly known as Farbwerke Hoechst AG. It is stamped with the date “3 February 1912” and was sold by a British chemist, W Martindale, who added all the equipment to prepare injections from the yellow powder.